In what has become a recurring theme during this MVP race, Elena Delle Donne just suffered an injury that will keep her sidelined at least two weeks. One year after a right thumb injury forced her to miss the playoffs, Delle Donne will now undergo surgery on her left thumb. It’s another tough break for the Mystics, who have been hit hard by injuries and overseas commitments this season. Delle Donne had already missed four games before hurting her thumb against Atlanta on Sunday, and she will likely miss an additional four or five. Thus, just as we are doing with the injured Brittney Griner, this list will not feature Delle Donne until she returns to the court. Meanwhile, the top two challengers to Sylvia Fowles both reside in Los Angeles. Candace Parker rises to No. 2 after a historic week. It’s time to get serious about Fowles becoming WNBA MVP. 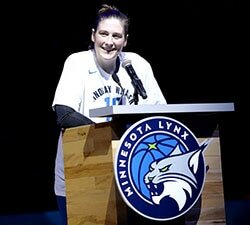 The Lynx are on their way to one of the best seasons in league history, and both Delle Donne and Griner are now out of the picture. The moment Minnesota clinches first place could be the same moment Fowles clinches her first MVP award. This past week was another display of brilliance, as the 31-year-old center averaged 29 points, 10 rebounds and three blocks on 76% shooting in victories over Seattle and Atlanta. Parker leapfrogs her teammate thanks to her triple-double on Friday at San Antonio. 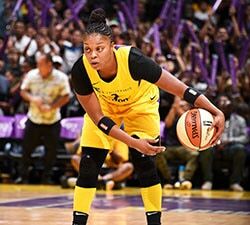 With 11 points, 17 rebounds and 11 assists in a Sparks victory, Parker became the sixth player in WNBA history to record a triple-double. The reigning Finals MVP followed it up with a not-too-shabby performance of 23 points, 10 boards and five dimes in Sunday’s dominant win over Dallas. The advanced numbers say Ogwumike has been more impactful than Parker this season. In fact, they say Ogwumike has been nearly as good as her historic MVP campaign a season ago. On Sunday, she dropped 22 points on 10-of-13 shooting in 25 minutes. The problem is Fowles has been doing that almost every single night. The Liberty’s daunting road trip was going well until they lost to San Antonio on Tuesday, becoming just the third team to do so this year. Charles had a quiet night offensively, scoring 13 points on 6-for-16 shooting. She could still compete with Fowles for MVP if the Liberty finish the season strong. They face L.A. on Friday in the final game of their road trip. It’s been 11 days since she lit up the All-Star Game, and Moore is still on fire. She scored 12 of her 24 points in the fourth quarter on Sunday to help Minnesota hold off the Storm. 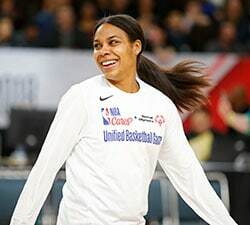 Moore continues to thrive from three-point range, which is exactly what the Lynx need as they rely on a dominant center like Fowles during her incredible season. Although her team lost to the mighty Lynx on Sunday, Stewart scored 20-plus points for the 10th consecutive game. She’s also getting it done at the defensive end: Stewart followed up her career night of six blocks against L.A. with five rejections the next game against Dallas. She just became the fastest player in WNBA history to reach 1,000 points and 500 rebounds. The Sun’s game against Washington was postponed, so Jones’ only showing of the week was a blowout win over the short-handed Fever. In just 24 minutes of action, the second-year center racked up 14 points, 13 rebounds, three blocks and a pair of steals. Jones continues to take and make three-pointers, as she has knocked down all four attempts in her last two games. While Jones notched a double-double against Indiana, Thomas had arguably the best line of the night with 14 points, eight assists, five boards, four steals and just two turnovers. It was her fifth game this season featuring eight or more assists. Thomas leads all frontcourt players in assists, a key reason why she could challenge her teammate for the Most Improved Player award. The Wings (11-14) have lost three of their last four games, and the only win in that span was a two-point victory over the Fever at home. With just nine games remaining for the Wings, it will largely be up to Diggins-Smith to keep them in playoff contention. She had scored 20-plus points in six straight games before finishing with 18 and 14 in Dallas’ pair of losses this past week. It’s a bit crazy to have three players from the same team on this list, but Gray is more than deserving. She remarkably became an All-Star in just her third year in the loaded Western Conference. Gray leads the Sparks in minutes, has the second highest plus-minus on the team and ranks as the best three-point shooter in the entire league. After emerging as a key contributor in the Sparks’ championship season, Gray carried that momentum into this breakout campaign.